An existing law bans judges from belonging to groups that discriminate based on sexual orientation. The Supreme Court ruling rids a section of the law that has exempted participation in youth groups with discriminatory polices. After facing years of pressure, the Boy Scouts recently reversed a longstanding policy prohibiting openly gay youth from joining the organization. 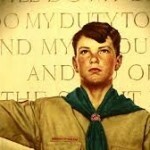 But, the BSA still bans homosexual adults from serving as troop leaders. The Supreme Court decision does not apply to religious organizations. Judges can still belong to any religious organization regardless of its discriminatory policies. The ruling gives California judges one year to cut their ties with the Boy Scouts. That irks some judges, like San Diego’s Julia Kelety who serves as a scout leader. Robert Glusman, the former president of the California Judges Association, said he supports the ban. Are they suppose to steer clear of the girl scouts as well?? or just the boy scouts?? So are we also to ban homosexuals from becoming judges, as they have a bias against heterosexuals? Should we prevent anyone from ever being in any group or organization to become a judge? Where are the angels that will be running our society? Where are these perfect beings? This decision is why California is viewed as incompetent and self-destructing. Play to the lowest-common denominator (aka ill-informed, usually democrat, voters) and consolidate liberties, freedoms and power. Why do we allow this to happen? Because we don’t dare be “anti-gay?” or anti-whatever? Really? I think the judges need to be removed, as the precedent that this ruling will set is VERY dangerous. This is not a gay / anti-gay issue, this is now a morality-police issue. Is that also what the LGBT “community” is supposed to be fighting against? Tell me you cannot see this morphing into further “pruning” of judicial selection process. Want to be left with only blue-eyed Aryans? This is how you start to get there. Unbelievable, but not surprising for California and the nutjobs that run this asylum.